CNG: eAuction 417. Divus Augustus. Died AD 14. Æ Dupondius (with frame) (29mm, 7.90 g). Rome mint. 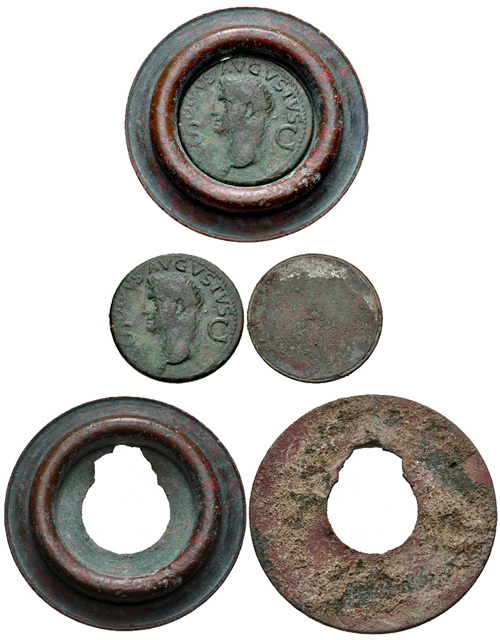 Struck under Gaius (Caligula), AD 37-41. 417, Lot: 421. Estimate $200. Divus Augustus. Died AD 14. Æ Dupondius (with frame) (29mm, 7.90 g). Rome mint. Struck under Gaius (Caligula), AD 37-41. DIVVS AVGVSTVS, S C across field, radiate head of Augustus left / Blank. Cf. RIC I 56 (Gaius) for coin. Fine, dark green and brown patina, minor smoothing on obverse, reverse lathed smooth. Lot also includes 52mm bronze frame (40.04 g) with inner circular rope border that wraps around coin. Probably used for decorative purposes, and interesting as such.